Far western University, Faculty of Agriculture Science Tikapur Multiple Campus, Tikapur, Kailali announces admission in Bachelor of Science in Agriculture ( B.Sc .Ag.). 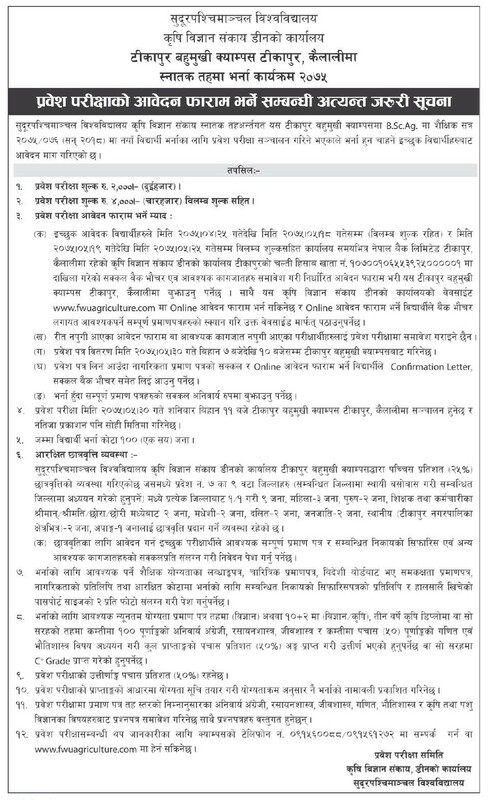 Interested students should fill up the application form by Bhadra 18, 2075. The entrance examination result will published on the same day of entrance examination. Students who have completed 10+2 or equivalent with at least 50 % or 'C+' grade are eligible to appear in the entrance examination for admission in B.Sc.Ag. program of Far Western University.